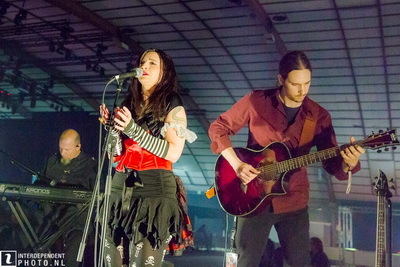 To the best of my knowledge, this was something of a first for MFVF, at least I can’t recall an acoustic set like this before. There had been something similar a couple years ago, but not in the same kind of setting. I was there for pretty much all the evening but my memory is a little shaky on exactly what happened. I showed up at the Tower Hotel in Aalst about 2:30 and before I could check into my room I ran into Lindsay Matheson (or Schoolcraft if you prefer) and Aziza Poggi in the lobby. They were in immediate need of a ride to the venue to get ready for the evening so I ended up taking them over. Got there about 3:30 and had a 4 hour wait for the first performance. Well, it was a little early to hang out with the crowd since they weren’t there, so the only alternative was. . . ah, to drink. Fortunately, they were pouring back in the VIP section and were generous to early arrivals, me, and I put in a pretty good effort. Well, 7:30 finally arrived and a small stage had been set up off in a nice, intimate location in the giant Oktoberhallen facility. My roommate Ton Dekkers arrived and we both headed to the front of the little stage with cameras. The performance began with Kirsten from Evig Natt doing a version of I Die Again with a limited guitar accompaniment. 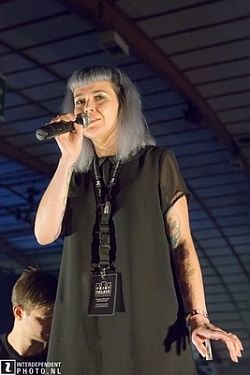 She was shortly joined by Kassy from the new American / Dutch band Mercy Isle for a duet. And that’s pretty much how the evening proceeded. 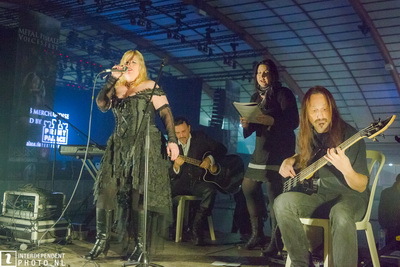 There was a long list of performers, some from bands who would play later on the main stage, many who were at the event for the acoustic set only. And, there was a lot of duel performances. It would take some time to mention each performance, there were a lot and, as people came in, there was a lot of socializing. But, we will mention as many here as possible, especially if we have photos. Andrea from Rainover in Spain was next. I’ve been communicating with the girl for a while but, sometimes the “real” version of a singer is a little different than the one we have in our mind. 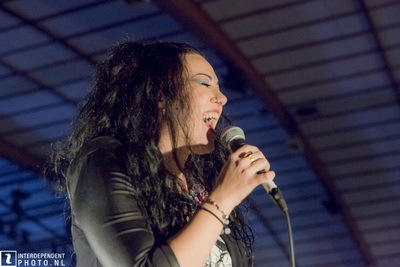 Andrea has a strong voice and does some solid metal which gives the impression of a strong female, physically, that is. But in person, a cute, petite little girl, not at all what I was expecting. But, on stage, even in this style of music, the voice betrayed the physical personae. Later, when I got to spend time with her she proved to be as lovely as the solid voice I had become accustomed to. Aziza from Aria Flame, supported by AF guitarist Daniel Cruzan and keyboardist Joop de Rooij, showed up next, doing a lovely version of My Own Little Hell from their last release. 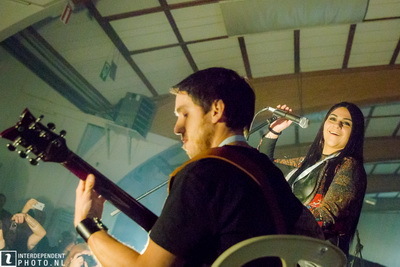 Aziza has a highly trained classical voice and performed a number of times during the event. We got some “first time” performers at this performance. 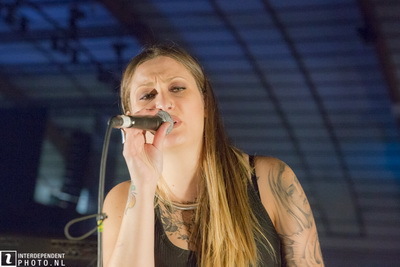 One was Ana Carolina from the band Mourning Sun in Chile. She’s not the typical metal performer but, instead, has a more relaxed vocal style, something that worked perfectly in this environment. 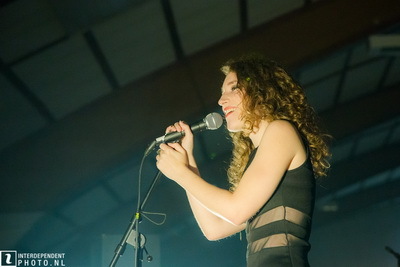 Her performance the next day was more like what we heard Friday night, only with a more extensive support staff. Worked well either way. 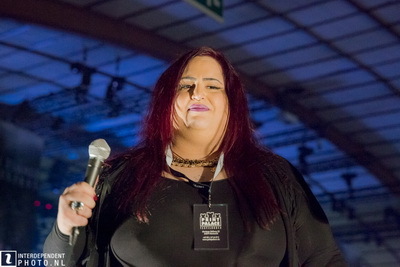 American Phyllis Rutter appeared a number of times, working with a number of performers. Her work with one of my favorite performers, Gaby Koss, was interesting from a number of perspectives. At one point, the prerecorded material they were working with on stage malfunctioned and, like true professionals, they made it part of the show. But, two voices like this are hard to ignore. 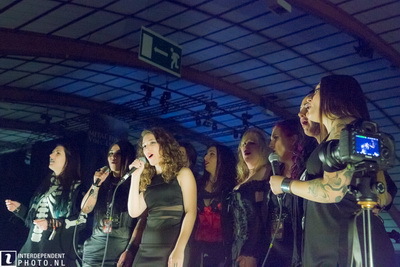 Both worked with other performers doing a variety of musical styles. 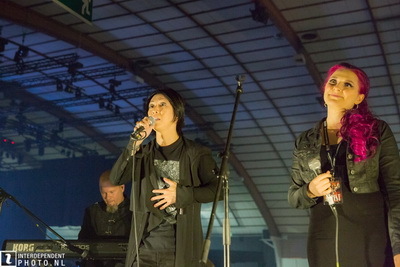 About this time Japanese vocalist Satsuki took the stage to perform with several performers. Satsuki is, so I’m told, a rather big name in Japan, and his work here was solid. 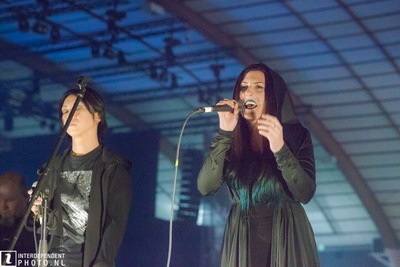 He performed first with Lindsay on Evanecence’s “My Immortal,” and then Kassy on his original song “You” (in his native Japanese). Both ladies are more than a little comfortable working with male vocalists, but maybe not in Japanese. Fortunately, there had been some intercontinental rehearsal so all went well. There was a short beer break about here, not that I didn't take my own along the way but a formal one is always appreciated. 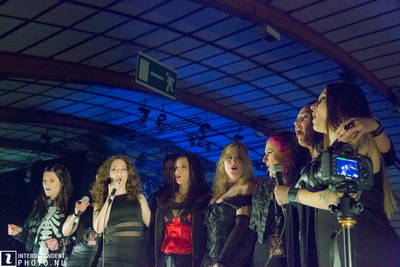 Following the break Kassy kinda took over for a while, performing with vocalists Aziza, Lindsay, and Phyllis. 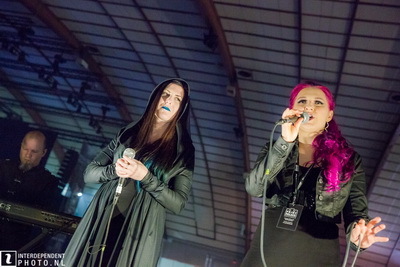 Kassy and Aziza is not exactly something new for me, they’re damn near sisters so this one was pretty well rehearsed (especially as they had performed Mercy Isle’s song “Saying Goodbye” several times together while both their bands were on tour together in 2015). Kassy and Lindsay’s performance was almost the same; these ladies all know each other well and it showed on stage. All this was followed by the Greeks. 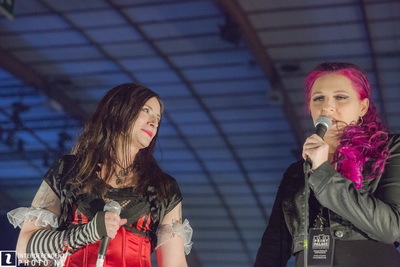 Iliana and Sanna did a song, then Iliana and Maxi Nil. Yea, I know, they’re not all Greeks but, by this time the evening was getting a little hazy and many of my shots were getting out of focus. The musical excellence, however, continued unabated. 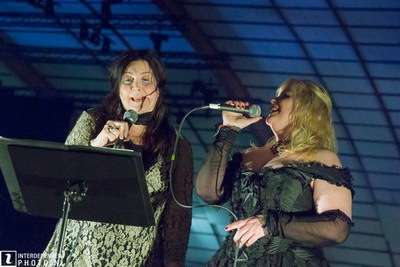 There were a number of other performances, mainly duets featuring ladies who had performed previously. Like Kirsten joining Sanna. 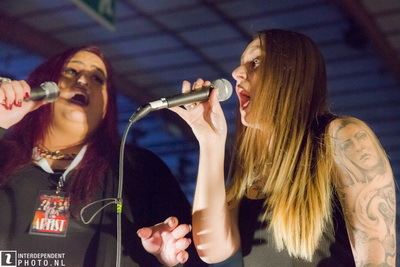 Some great stuff but one that stands out, at least for me, was Lindsay and Andrea doing a version of Nymphetamine by Cradle of Filth. I knew this one was coming since I had heard Lindsay rehearsing it backstage on the keyboard shortly after we got to the venue. Being as how it’s one of my favorite songs, I cleaned up my act a little to give it a proper hearing, and I wasn’t disappointed. Lovely rendition, even if Danny Filth was far, far away. The last couple the rejoined the stage was Phyllis and Gaby. It was that kind of evening. Very different and a somewhat different sound than what we generally expect from these ladies. 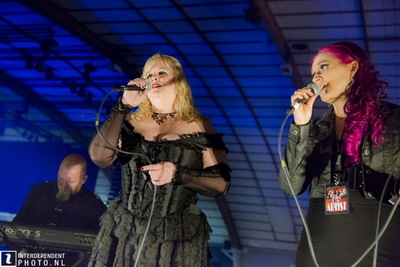 I recall the next day hearing several people comment that, after hearing Kirsten do her set with Evig Natt, they couldn’t believe it was the same vocalist. Several people said the same thing about Kassy even though there was probably no one there who hasn’t heard her previously doing a variety of styles. I’ve certainly heard her more than pretty much everyone so the variety wasn’t as much a surprise to me. But, it was interesting to see, and hear, the capabilities of these highly talented women. We know their metal style, on this night we heard something else. A nice diversion, if only for a night. But, I think everyone was looking forward to the metal ahead. . . and, wouldn’t you know it, that metal began the next morning with Kirsten and Evig Natt.